If you have any trouble with poor formatting here, you can read the original post at this blog. You can download the copy of the binary here. During the competition, we could ssh into one of their machines to exploit and read the flag. So, instead of crashing it miserably, the handler will be called. Let’s examine what this handler does. 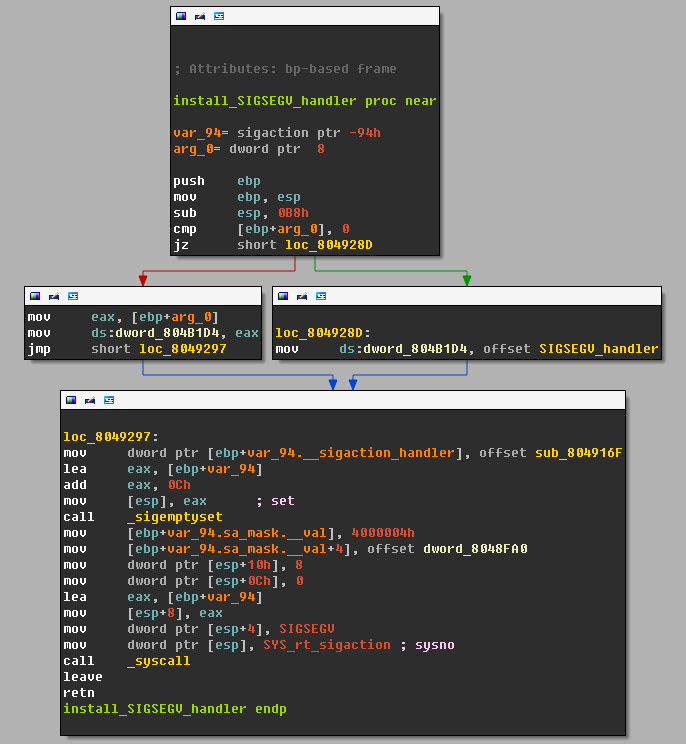 Now, if we look at the SIGSEGV_handler, we may think it doesn’t really do anything useful. Note that it just fills up exception information and calls cxa_throw to throw exception. At this point, we could go on and explain what SIGFPE_handler does as well, but we’ll skip it since it’s not that interesting and is not needed for a successful exploitation. You may ask — so, what’s left? 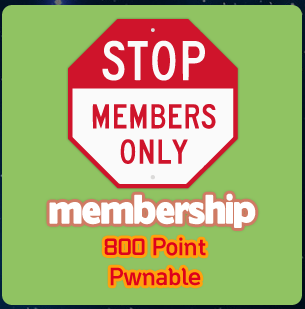 Take a close look at the entry with “pc=08048fa7..0804904d”. This entry basically describes what should happen when the exception is thrown between that PC range. Note that the SIGSEGV_handler throws an exception at 0x0804901A , which is in that range (that range is precisely SIGSEGV_handler function). Ok. Now, we have to make sense of what all those operations mean :) DW_CFA_val_expression contains CFA expressions that are defined here. So, in short, it checks if the username is “stdchpie” and the password[2:5] is equal to “\xb1\x2e\x40”. If any of the condition fails, it transfers execution to 0x8048f18, which does exit(0). .text:08048CF0                 mov     dword ptr [esp], offset aNested ; "nested"
This code prints out “nested” string and writes password[5:9] to *password[1:5]. Meaning, we get to write anything in 0x402eb1?? address space with any 4 byte value we choose. 4-byte write is pretty strong tool in exploitation, but when we are limited to 256 byte range, it’s difficult to make it useful. Also, it immediately jumps to 0x8048cc0 , where it does another null pointer dereference causing SIGSEGV to happen — thus, we get infinite “nested” string printed out. With carefully constructed password, we can overwrite any 4-byte value to any address in between 0x402eb100 and 0x402eb1ff. As we can see above (highlighted), the address range falls into libgcc’s memory — specifically, it matched portion of its .bss section. /* Find data-&gt;pc in shared library cache. 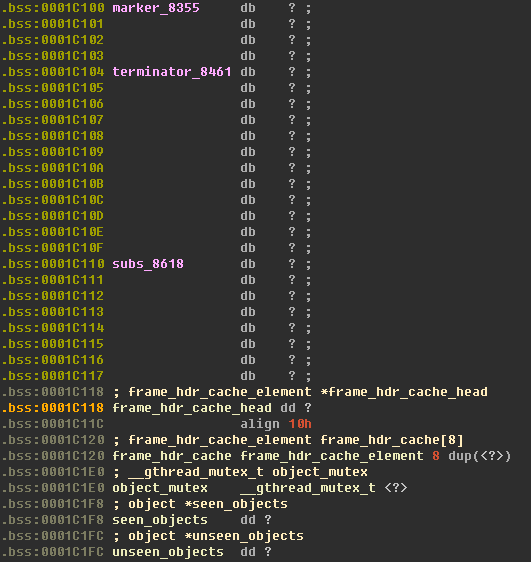 So, if we control where frame_hdr_cache_head points to, we can also construct/control the elements inside. Before we dive into what happens when we find an element in the cache and goto found, let’s step back for a minute and see if we can even get to here and what that allows us to do. 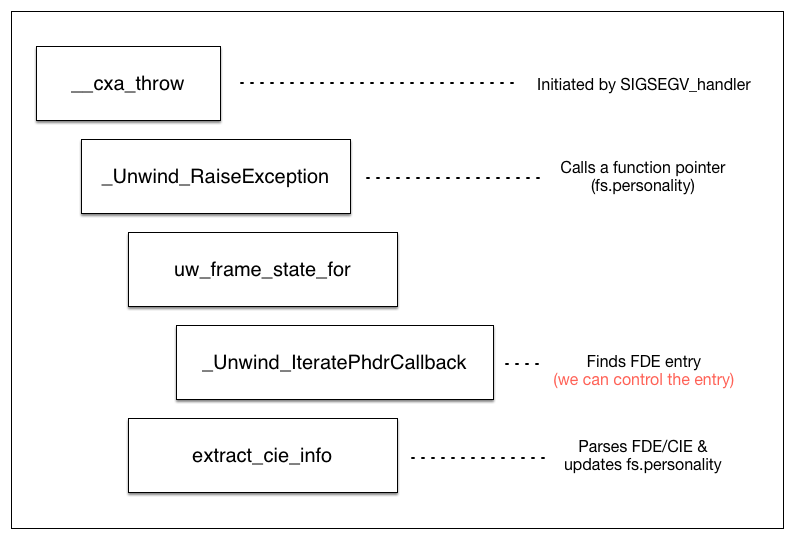 The function we just looked at (_Unwind_IteratePhdrCallback) is called from _Unwind_Find_FDE in unwind-dw2-fde-dip.c. Then, _Unwind_Find_FDE function is called from uw_frame_state_for function in unwind-dw2.c. uw_frame_state_for function is called from _Unwind_RaiseException function in unwind.inc, which provides an interface to raise an exception given an exception object. Where does _Unwind_RaiseException get called, then? It gets called by __cxa_throw, and if you remember, our SIGSEGV_handler invokes this function to raise an exception. A function pointer getting called! And we *may* be able to control fs.personality. Let’s find out! Remember that the struct pointer that we are interested in tracing is fs (aka 2nd argument). Wee see here that _Unwind_Find_FDE is used to get fde (which is used to get cie), and extract_cie_info takes cie and fs as its first and third argument, respectively. Cool. extract_cie_info parses cie and updates fs->personality. We’ll work out the details later. As we discussed earlier, _Unwind_Find_FDE calls _Unwind_IteratePhdrCallback, which fills the data struct. Then, it returns data.ret. 359   /* We require here specific table encoding to speed things up. Finally, we can start writing some ~evil~ awesome payload to pwn this binary. When creating a fake cie struct, we make the personality function pointer 0x8048E97, where it does execlp("/bin/sh", "/bin/sh", 0), and get a shell!! As we can see in action, this payload triggers the bug and causes infinite SIGSEGV. We currently chose 0x402eb101 for no particular reason, but we can see that memory is successfully written. So what values should we use? To not worry about the search too much, we are going to set pc_low to 0x0 and pc_high to 0xFFFFFFFF. This basically says that this cache entry should be used for any exception thrown in this range of addresses — so we’ll catch everything. Also, to make it easy to do math, we are going to make load_base to **. 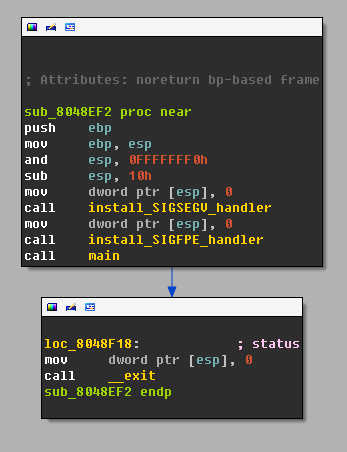 Finally, we have to set **p_eh_frame_hdr pointer to the fake Elf32_Phdr struct. We will put this fake phdr struct right after our fake cache_entry struct that we are currently building. The rest of the fields are not really used (for our purpose), so we can put dummy values. Then, on line 315, hdr is calculated by adding p_eh_frame_hdr->p_vaddr and load_base, thus pointing 0x40025054. Time to build a fake hdr struct! Starting at +0x54 from our buffer comes the hdr struct. It’s a 4 byte struct and we fill in reasonable values here, according to the encoding scheme mentioned above. Then, as we saw earlier, eh_frame is read. Since the value is supposedly encoded with (DW_EH_PE_pcrel | DW_EH_PE_sdata4), this value in our data should be an offset from where the hdr is. However, the value of eh_frame isn’t really related to what we do, so we can put any value (read_encoded_value_with_base actually does the calculation given the base to correctly compute eh_frame’s value). We have picked the values for encoding schems such that we satisfy both conditions. Then, fde_count is read. Since we do not want to create more than one set of fake structs (to be searched with binary search later), we will force this to be 1. As mentioned earlier, in order for the search to succeed, we need to satisfy table[mid].initial_loc + data_base <= data->pc < table[mid].initial_loc + data_base + range. Note that data_base is pointing at hdr (0x40025054). So we can set initial_loc to 0xBFFDAFAC such that initial_loc + data_base == 0x40025054 + 0xBFFDAFAC == 0x0. Also, the fde field is actually an (signed) offset from hdr — due to (DW_EH_PE_datarel DW_EH_PE_sdata4) encoding. So, we set it to 0x14 to indicate that our fake dwarf_fde struct will be located at 0x40025068. The current payload, when fed to the program, will result in a crash since it will read an invalid value for the range. To make data->pc < initial_loc + data_base + range true, we need to construct a fake dwarf_fde now. We are going to make the length 0x1C, and CIE_delta to 0xFFFFFFE4 (such that &CIE_delta &mdash; CIE_delta == 0x40025088 — this will be explained later). We will set pc_begin to 0x0 (doesn’t really matter what we put here). What comes after pc_begin is the range. To explain a little bit, on line 412 in unwind-dw2-fde-dip.c, range is read from** f->pc_begin[f_enc_size]** where f_enc_size is 4, making the 4 byte right after pc_begin be the range. Since we made the init_loc to be 0x0, we will make the range to be 0xFFFFFFFF. Then, we pad the last few bytes (so, technically we can fix the length, but that’s what we used during the competition). Data that follows after augmentation string (code_alignment, data_alignment, return_addr_col) are read in first. We chose these values just because we saw these in normal CIE struct, but it shouldn’t matter what the values are. Remember (from a while ago) that there was code that does execlp("/bin/sh", "/bin/sh", 0)? For those who don’t remember, it’s located at 0x8048E97.